X-bit Labs reports AMD's 10-core and 20-core Opteron processors will be a no-show as the company has decided to prolong the lifespan of its current Opteron platform. Advanced Micro Devices has cancelled its multi-core Opteron server chips code-named Sepang (up to 10 cores) and Terramar (up to 20 cores) that were supposed to be launched in 2012. Moreover, the company decided to keep the existing server platform for its 2012 - 2013 server refreshes, which means that AMD-based machines will not support numerous new features. 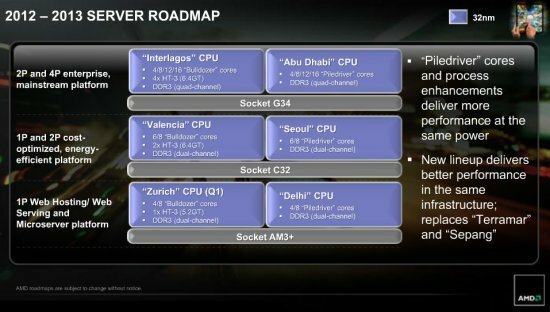 In the 2012 - 2013 timeframe AMD plans to release Opteron code-named Abu Dhabi microprocessor with up to 16 Piledriver cores for 4-socket servers, Seoul central processing unit with up to 8 Piledriver cores for 2-socket servers as well as Delhi chip with up to 8 Piledriver cores for 1-socket servers. All the new CPUs will fit into existing socket G34, socket C32 and socket AM3+ and will therefore bring no improvements on the platform level. The new processors will be made using 32nm SOI process technology at Globalfoundries. Both chips are currently expected to arrive in the second half of the year.